Team two went home today, and unfortunately the weather did not cooperate with us during the final days and we did not go out to sea. The team did, however, get a chance to see common dolphins in the harbour yesterday when they took the ferry to Pico. Being good expedition members they even collected all the POPA data (except for a water temperature) “just in case”. Many thanks to all the team members from both groups who kept their spirits up despite the challenges the weather threw at us this year. I know it was disappointing not to go out to sea every day that that we were scheduled to, but hopefully you made the best of your time here in the Azores and go home with fond memories of the group. 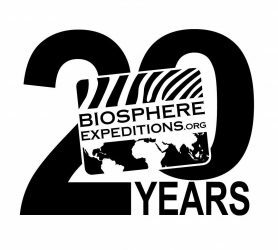 Your legacy is in the details, so to speak, and with so much data entry from all of you we have quite caught up with all the data that has accummulated over the course of past expeditions. Thank you! 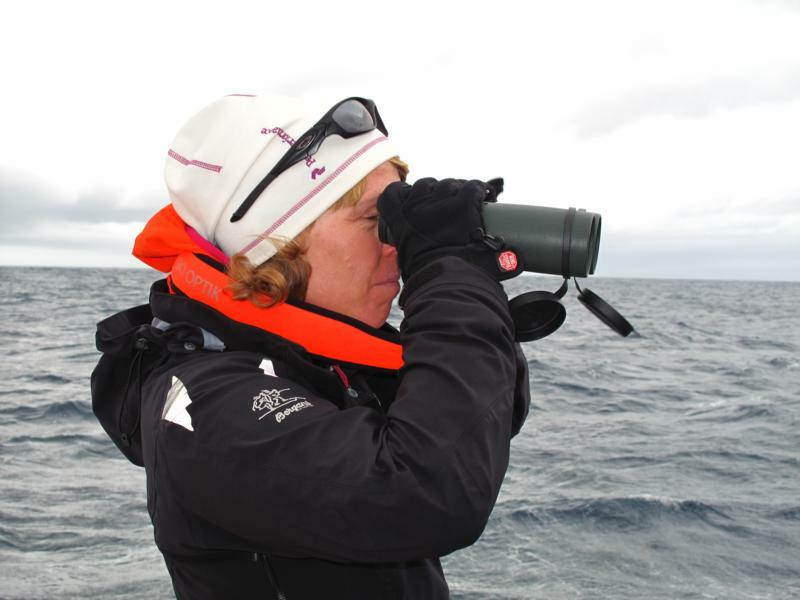 I’d also like to thank Buff for donating Buffs to keep us warm and dry, and Swarovski Optik for our new snazzy binoculars. 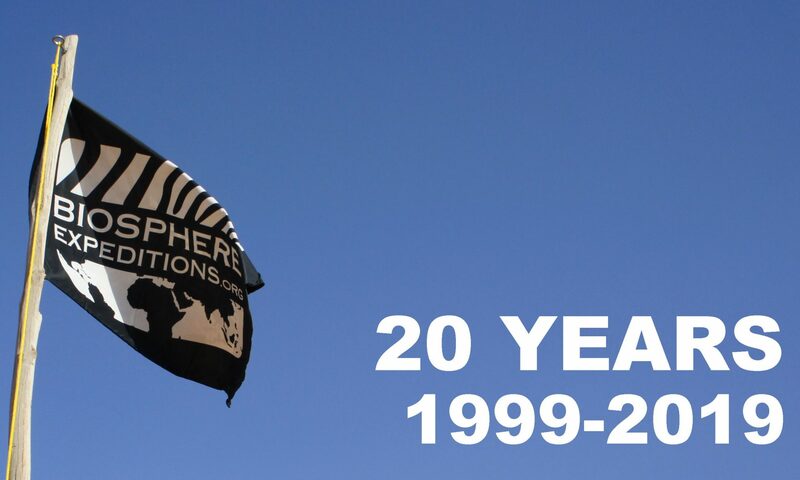 I hope to see you again on another expedition, some time, some place. Safe travels everyone and thank you again for your support. Finally we’ve had a “calm” day in which we are able to use our new Swarovski Optik binoculars. We’ve been keen to try them, and yesterday the sea and wind cooperated leaving expeditioners with a free hand to hold them! 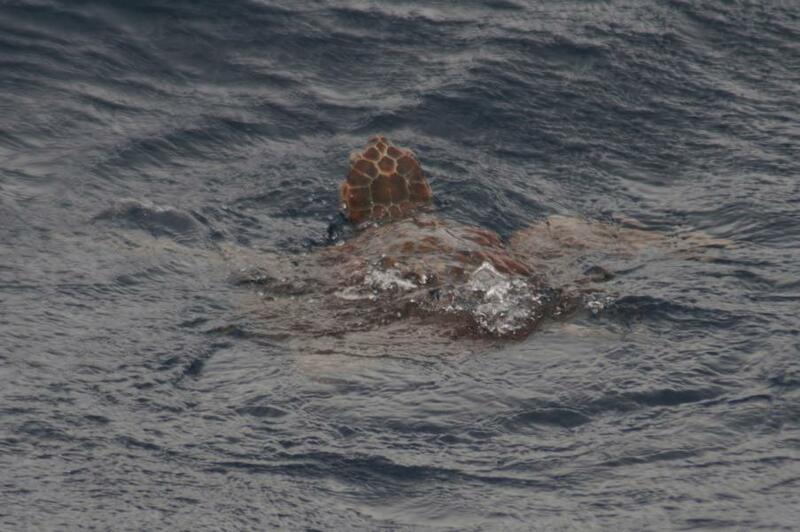 Just in time, too; Sabine spotted a 40 cm sea turtle. Although we didn’t see any whales yesterday, we received terrific news. Our scientist Lisa has only seen a handful of humpback whales off the shores of the Azores in the twenty years she’s been conducting research here, but just yesterday she received word of a match. 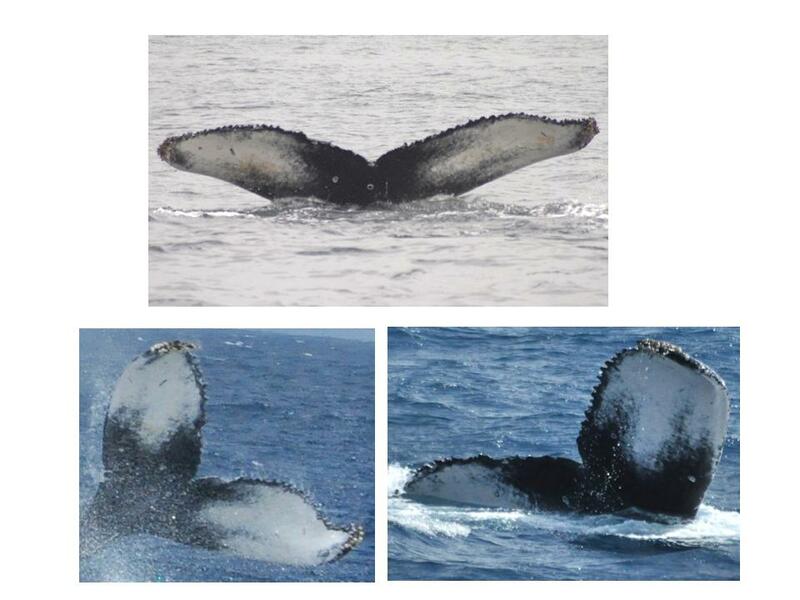 A humpback whale seen here in the Azores in 2006 has just been identified in the Cape Verde Islands. This is only the third such match she’s made. Other matches this season include two out of the 19 whales identified on Tuesday. 2350 was first seen in 1999, then again in 2008 & 2009. The other was seen in October of 2010 and this year she had a 2 year old calf with her! The photos below are 2350 as seen in 1999 & yesterday. 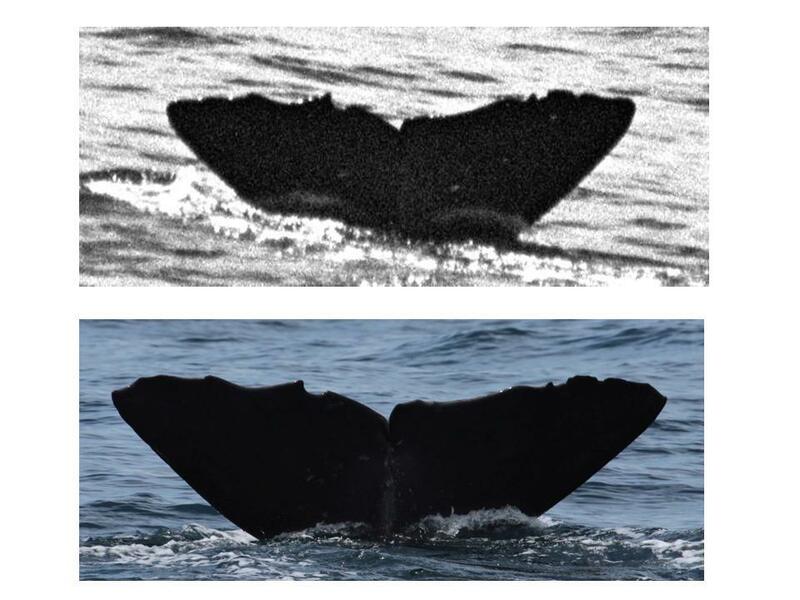 Such matches are very important as accurate knowledge of the origins of the baleen whales passing the Azores archipelago during April and May will help to determine which stocks they come from and assess more accurately their true numbers (which are often inflated in efforts to set or reintroduce hunting quotas). On Thursday our searching was not in vain either, through some choppy seas. We found a group of bottlenose dolphin that actually appeared to be enjoying the waves! They were surfing! 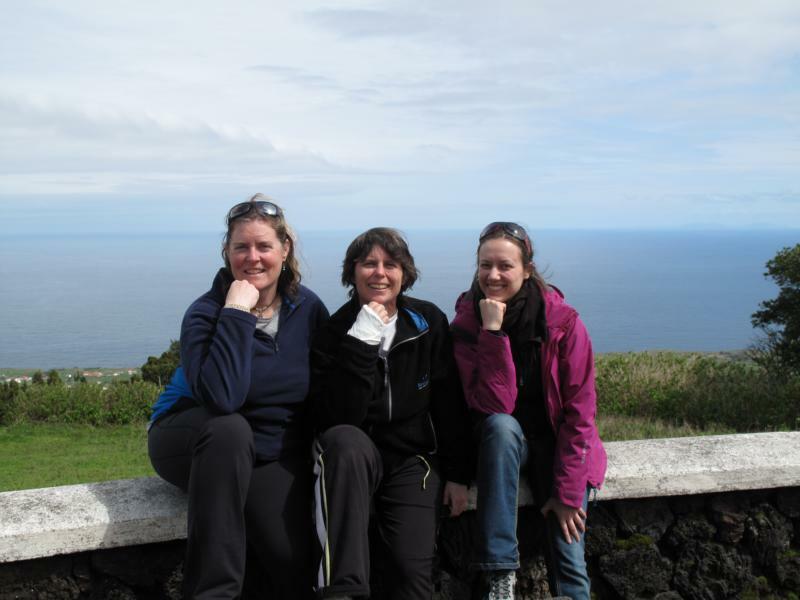 It was the main resident group that we tend to see often around Faial & Pico. Vera Menges was born and educated in Germany. 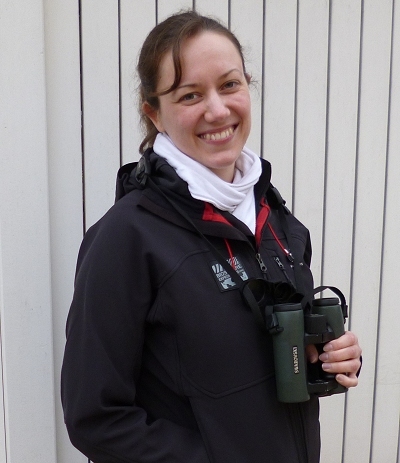 After spending a couple of years abroad (UK & New Zealand), she graduated from the Westphalian Wilhelms-University Münster in Germany with a Bachelor’s Degree in Biology and from Edinburgh Napier University in Scotland with a Master’s Degree in Conservation and Management of Protected Areas. The latter was based on brown bear research in Sweden in collaboration with the Scandinavian Brown Bear Research Project. Since then, she has worked for the bear project as well as for a lynx/roe deer research project in the Bavarian Forest National Park, Germany. She is putting her skills and her passion for wildlife research and conservation towards pursuing a PhD in carnivore research as well as mitigating human-wildlife conflict by working at the big cat and elephant project in Namibia. I have just hit the ground running in Namibia, arriving a few days ago and learning the ropes with people here on our Okambara study site. My flight with SAA to Windhoek was great, but their broccoli and beans vegetarian meal takes some getting used to. But brocolli and beans was followed by a leopard and two cheetahs within a couple of days. 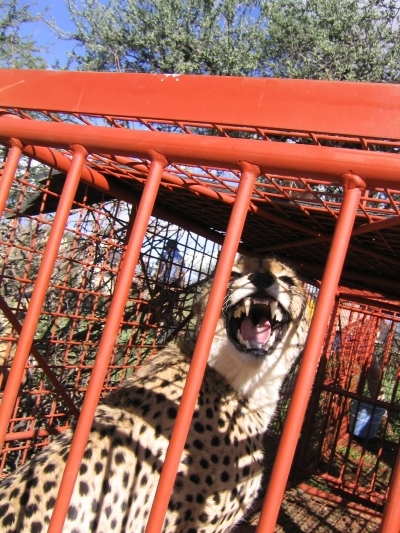 The leopard needed some attention from a vet and my colleagues here captured and collared two cheetahs just in time for my arrival – what a welcome to Africa and incredible piece of luck! Anyway, over the next three months, I will be sending you some irregular updates of my work here and the preparations for the expedition, starting in August. Watch this space and the links below. Gordon’s quote of the day was “there were too many flukes to count!” We encountered several groups of sperm whales in the morning and went from group-to-group-to-group for the entire day. At one point there were as many as sixteen whales at the surface, and seven of them fluked almost simultaneously. Then the rest fluked and we got several excellent identification pictures. There were three large males in the group that made the adult females they swam with look live calves. Further, at the debriefing we identified seventeen unique flukes in a single day, which is a Biosphere record for the Azores. Needless to say our scientist Lisa was ecstatic. Branko was out team photographer for the day, and he took the whale tail that we’ll all use for our screensavers. Sabine was our super spotter of the unique and wondrous, and managed to see a palm-sized loggerhead turtle, several types of phytoplankton, and a floating egg sack. Be sure to ask her about the sea snake. 🙂 Several team members also saw a shark flash by the side of the boat. Add common dolphins, bottlenose dolphins, and some Rissos dolphins, and we call it a stellar day. Today was Team 2’s second day at sea, and despite the rough sea we were lucky enough to see the first sperm whales of the season. The group included one calf, and we spent the morning with them. There were a total of eleven sperm whales socialising at the surface, and two of them cooperated nicely with our research team and fluked for us. 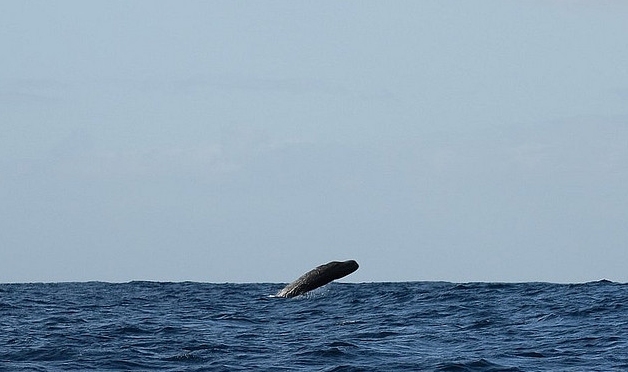 Perhaps the highlight of the day was when we saw a sperm whale breaching repeatedly in the distance. Fingers crossed for some sunshine and some more target species tomorrow. Update from our conservation holiday volunteering with lynx, wolves and wildcats in the Carpathian mountains of Slovakia. (http://www.biosphere-expeditions.org/slovakia). Tomas has sent in some more results of our camera traps. First from the wolf carcass camera where this year’s expedition found a dead deer (probably killed by a single wolf). Apparently there were a lot of pictures of foxes and pine martens, but in the middle of March a really big bear also started to check the carcass. The other pictures are from traps placed on the ridge close to lake Blatne.There is a really nice example of a wolf hunting with first deer and two minutes later a wolf passing the trap. With your help we have found that this location is very good for camera-trapping wolves. Half the team went to Pico today and the other half is working on the mural in the harbour. We’ve had a horrible few days with absolutely atrocious weather. We broke all sorts of records on this slot that we really did not want to break: number of days with weather too bad to back out, least number of sightings, most cloud, coldest, etc. The list goes on! But this is what nature and the weather can be like and I think everybody understands this, even if it is of course very frustrating. Still, thank you for being such a great team with good spirits and using the time on land for data entry, picture analysis and other activities to help out Lisa with her research. Still, on Saturday we had a small break in the weather and went out to sea for the morning. We had three random sightings of common dolphins on the way to where the lookouts said there was a blue whale. We then stayed with the whale for over an hour, but four metre waves prevented us from taking any good identification photos. 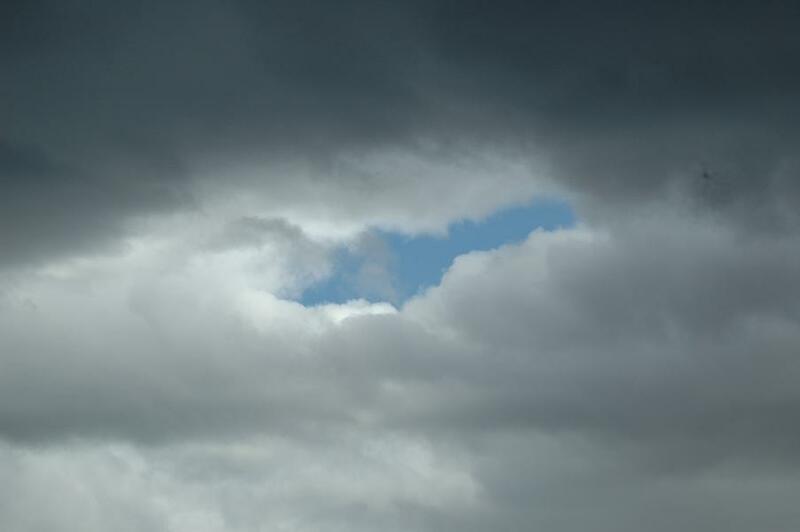 Believe it or not, there was also a bright spot, a single one on Thursday, which Neil managed to capture on the Nikon. Today was slot 1’s first day at sea. 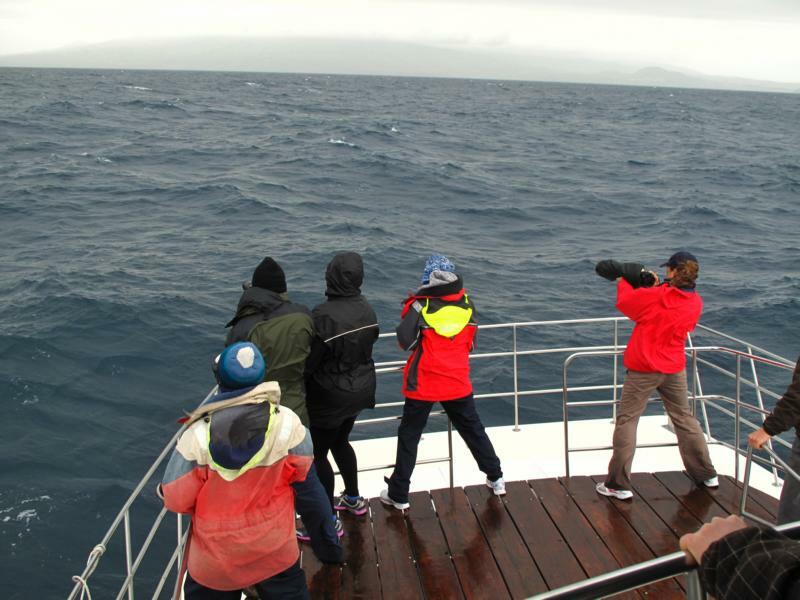 The swells were quite large, and our team members bravely hung onto the rails while searching for cetaceans. After sighting our first group of common dolphins, however, many of our team members discovered they hadn’t quite gotten their sea legs. 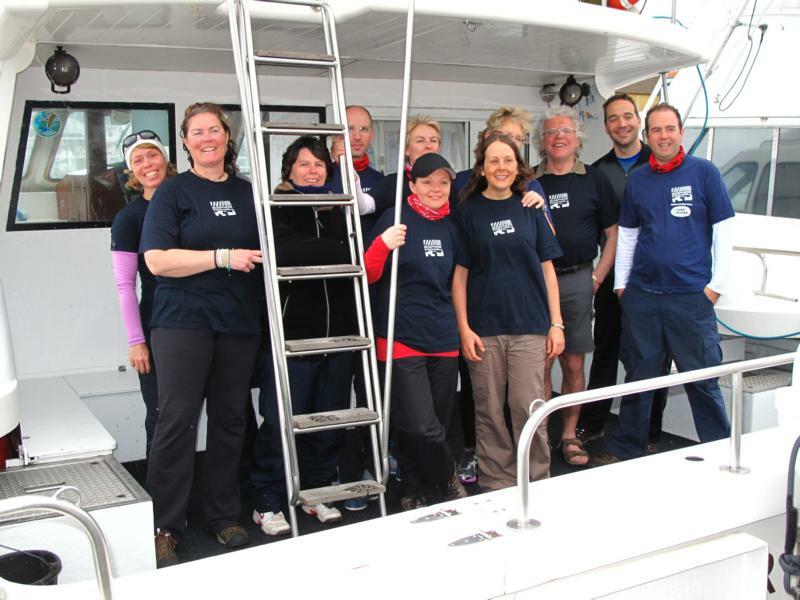 When the fish feeding group at the back of the boat (myself included) grew to more than half the team, we decided to come back to the harbour. 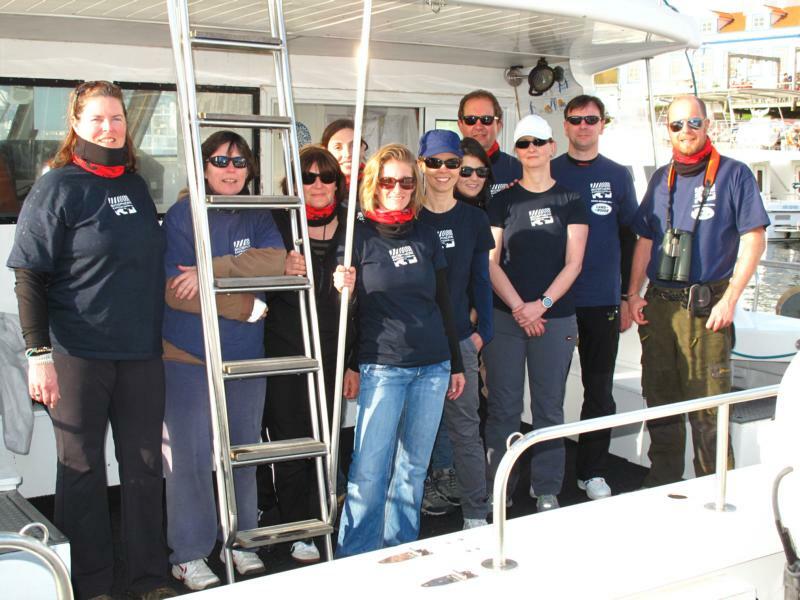 The lucky half of the team not affected by the large waves sighted three Risso’s dolphins on the way back. 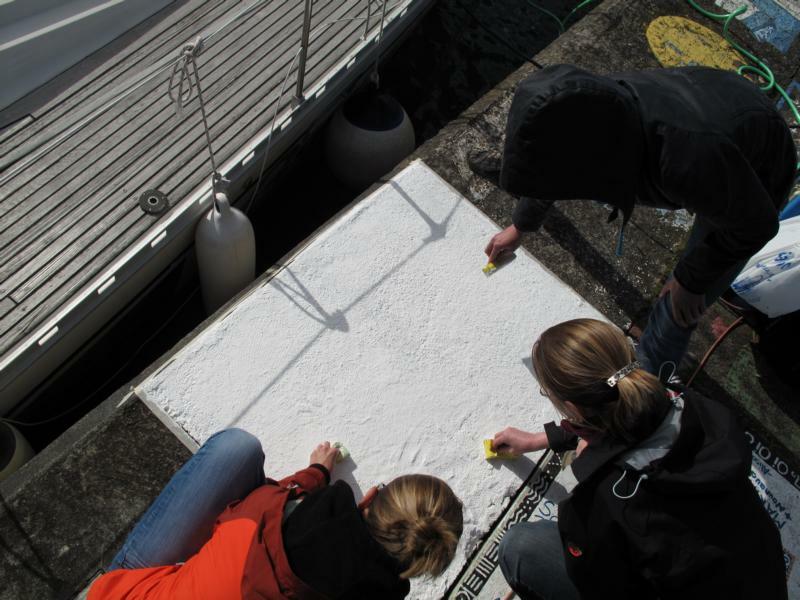 Joris, Annette, and Christina then decided to take advantage of the shore time and began this year’s wharf painting, a good-luck tradition here in the Azores, while the rest of the team helped with data entry at home base. have been very busy preparing for your arrival. Base camp is all set up, and we are eager to greet the first team tomorrow. As it says in the dossier, we’ll be at Peter’s Café at 11.30 on Monday morning to have some lunch, so if anyone would like to join us that would be great. If not, we’ll see you all at the official meeting time between 13.00 and 14.00 at Banana Manor. The expedition briefing will start promptly at 14:00. I hope you all have good journeys. Please call me if you are going to miss the assembly meeting at Banana Manor. I am eager to meet you all!